Home IssuesCharity	Could You Spare Some Change? Could You Spare Some Change? Some of us find it in our hearts to drop a couple of coins into the cup, but most of us just keep walking, trying to pay no mind to the person begging on the streets. You continue on, like any good, hard-nosed New Yorker would, but halfway down the block that feeling sinks into your stomach. Should you have dropped some change into that cup? Homelessness as a concept is something that is very strange to us. Because many of us have never been homeless, we never regard those who have as our equals. Instead, homeless people become an “other” for us. Though they’re human, we regard them as something else. But in reality, they could be any of us. In an unsure economy like this one, the average American could end up on the streets at any given moment. Maybe it’s time to reconsider our attitude toward the homeless. Fred Wilcox, a writing professor at Ithaca College, seems like your average college professor. Dressed in a sweater over a collared shirt, there’s nothing about him that would provoke you to think he was different from anybody else. But Wilcox was homeless on the streets of New York during his early to late twenties. Though he is now what we consider a ‘functioning member of society,’ Fred Wilcox once lived as the ‘other. So, he got on a bus, a one-way trip to New York City, from his home in Iowa. He arrived in New York with virtually nothing. He had no job skills, about $19 and only one suitcase. But all that aside, he was determined to never go home again. After his original plans to stay with a friend fell through, he found himself wandering the streets. He often sold his blood as a source of income and began to drink heavily. Wilcox described his life as one filled with nights sleeping on couches, floors and even once in a loft on a pile of costumes. He carried a knife around in his boot for protection. Wilcox got to experience the realities of homelessness first hand. And along with that reality came the reality of people’s resistance to give. One way or another he found a way out of the streets of New York, but this experience has shaped his perspective on giving to the homeless. Wilcox gives as much money as he can these days and encourages others to have the same attitude. After all, are we really that far from being homeless ourselves? “Does anybody have a secure job or a secure roof over their head?” he asked. In this economy, that is a very poignant question. 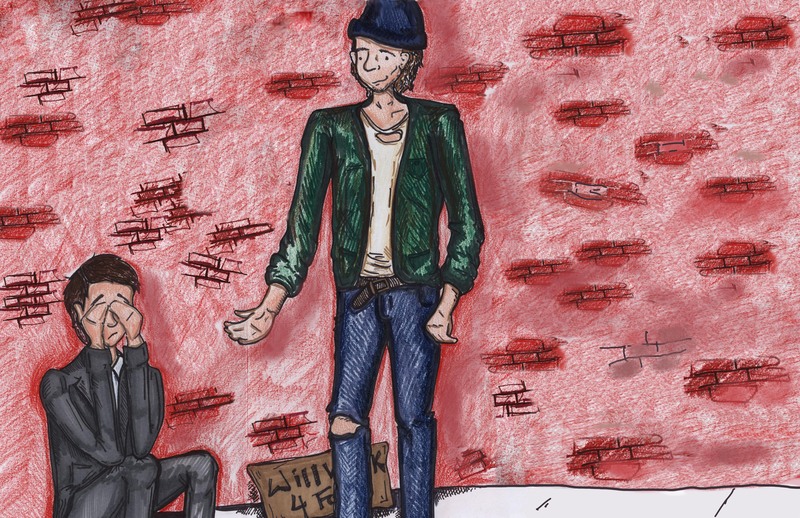 Wilcox offers a unique view as to how we should look at the homeless. Perhaps if we looked at the homeless through this scope we would be more willing to give our change. But will giving change to the homeless really combat the issue of homelessness? Roseann Viglione, property manager for Project Renewal, a private, nonprofit organization in New York City that runs a number of homeless shelters and medical programs, believes that giving our change to the homeless isn’t the right approach. Viglione previously worked directly with her homeless clients as the director of a shelter. She thinks that if we give our money to the homeless directly, we run the risk of having it be misused. “I always have a little bit of suspicion that people are not going to use the money for basic things like food… but that it is more on the drug and alcohol side,” Viglione said. Viglione believes that there is an avenue for everyone to give. In her eyes, our money is better going toward soup kitchens and other organizations. Many organizations like these exist, in New York City and beyond. In Ithaca one of the most well-known is an organization called Loaves and Fishes. Lyndsey Lyman, a junior at Ithaca College, spent time at Loaves and Fishes as a part of her research on poverty. Loaves and Fishes is unique in that it offers vegan food and other nutrient-heavy meal options. Lyman said the organization was unique because the servers took time to get to know the people they were serving. But, Lyman adds, giving to shelters and soup kitchens is not enough. For her, there is no “best” avenue to give. “It has to be a combination of things,” she said, adding that the shelter system doesn’t work for everybody. That being said, Viglione’s assessment would require our trust to be within the system in place for the homeless, but for Wilcox, this system is not enough. “The shelter system is based upon punishment rather than helping people,” Wilcox said. He criticized New York City’s mayor Michael Bloomberg, saying he has taken a punitive attitude toward the homeless, and as long as this punitive attitude is the dominant one, the shelter systems will never be a viable option. In 2005, the Bloomberg administration replaced Federal housing programs with a series of time-limited rent subsidies, a reform that, according to the 2011 “State of the Homelessness” report by the Coalition for the Homelessness, has been widely criticized for leading more families back into shelters and homelessness. Before the City began using time-limited subsides, an average of 2,003 “repeat families” entered the shelter system each fiscal year from 1999 to 2005, according to a study included in the report. From 2006 to 2010, an average of 5,020 “repeat families” entered the shelter system each year. The number of homeless families in New York City is 45 percent higher than when Mayor Bloomberg took office, with the total homeless shelter population having seen a 33 percent increase, according to City data included in a 2011 briefing paper by the Coalition. Viglione recognizes that the shelter system has flaws. Wilcox and Viglione’s views on the subject of giving are different, as are their experiences pertaining to homelessness. And yet they are the same in that they both recognize the importance of giving in some capacity. Through both of their accounts, it becomes clear that we need to start looking at homelessness as a real problem. Homeless people can no longer live as the outliers of our society. The solution therein lies in getting rid of what Wilcox describes as the “abstraction” around homelessness. “I think people who think we should punish the homeless and say it’s their own fault and don’t give them anything… should be required to live on the streets of New York find a tough neighborhood and live there for a week… They’ll change their tune,” Wilcox said. So here we are again, out for a walk when that familiar voice calls to us from the street. “Could ya spare some change?” Whether you drop your money in the cup or pledge your time at a soup kitchen, one thing remains evident: It’s time to respect homeless people as our equals. After all, you never know when you may be the one shaking the cup. Timothy Bidon is a sophomore journalism major who will always spare you some change. Email him at tbidon1@ithaca.edu.